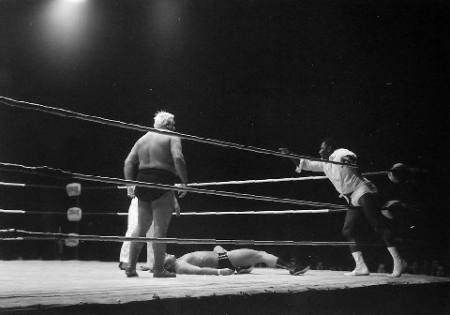 Fans were treated to four matches: the main event being a six man tag team match and a handicap match between Ripper Collins and Bobby Shane, plus two other matches. 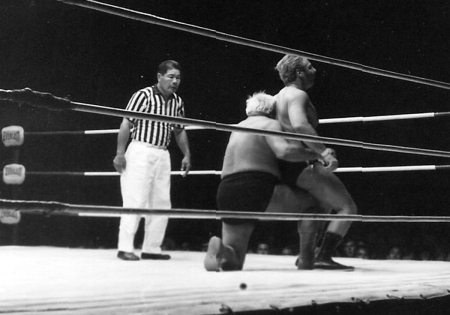 In the first two matches, Karl Gotch defeated Kongozan on a disqualification and the match between Tex McKenzie and Killer Buddy Austin ended in a draw. Tex McKenzie back flips Buddy Austin. In a special Handicap match, Ripper Collins challenged Bobby Shane, Collins stated that if he failed to beat Shane in two falls in 30 minutes, he would forfeit the match and purse. From the opening of the match Collins tried to get Shane down on the mat but it backfired when Collins threw Shane out of the ring and when Collins wasn't looking Shane came from behind and drop kicked Collins into the ropes and pinned him on the rebound in the time of 10:44. As the clock ticked down to the 1/2 hour mark, Collins started to panic. He finally got Shane from behind and gave him an atomic drop and Shane fell to the mat. But instead of pinning him, Collins gave him four more atomic drops and Shane was out cold. then all of a sudden Dory Dixon, a friend of Shane's, came running down to the ring from the dressing room. Dixon jumped into the ring to stop Collins from further injuring Shane. Dixon bent down to help Shane and Collins kicked Dixon in the stomach and dragged him to the far side of the ring. Ripper Collins gives Bobby Shane the Atomic Drop. Dory Dixon comes to the aid of Bobby Shane. 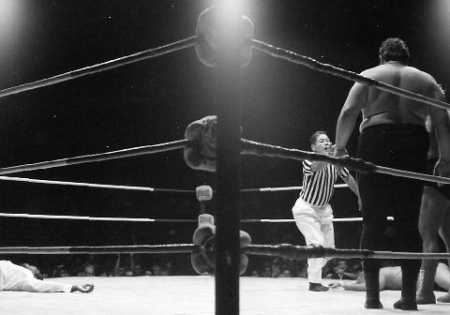 Gorilla Monsoon, who was acting as Collins' second at ringside, dived through the ropes at Dixon lying in the ring on his back. Monsoon then bunched off the ropes and splashed Dixon. At this point the bell rang and the referee awarded the match to Shane on a disqualification. Dixon was carried from the ring on a stretcher and Shane was helped out by Nick Bockwinkel. Referee Wally Tsutsumi disqualifies Ripper Collins. 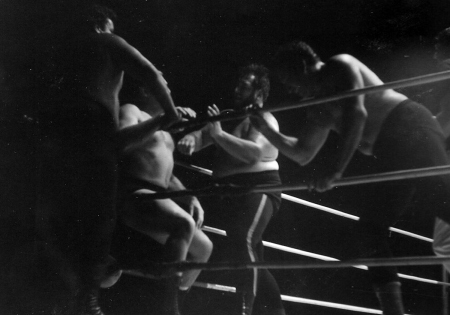 The main event was a six man tag team match between Curtis Iaukea, Gorilla Monsoon, and Rocky Montero against Pedro Morales, Nick Bockwinkel, and Karl Gotch. Gotch replaced Dory Dixon, who was injured in the previous match. 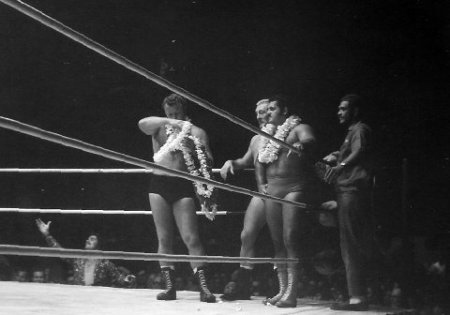 Nick Bockwinkel, Karl Gotch, & Pedro Morales receive leis. The first fall came when Iaukea gave Gotch a big elbow drop and pinned him in the time of 11:42. Gotch evened up the match for his team in the time of 6:21 when he used a submission hold on Montero. The last fall came when Montero pinned Bockwinkel in the time of 3:43 giving the team of Iaukea, Monsoon & Montero the win. 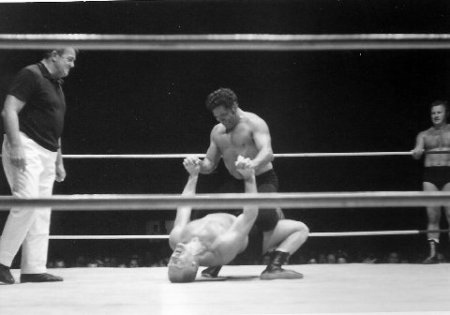 Karl Gotch bridges under Rocky Montero. Iaukea, Monsoon, & Montero work over Gotch in the corner.